Photo by Gullen Petty from Mummy's Gin Fund. 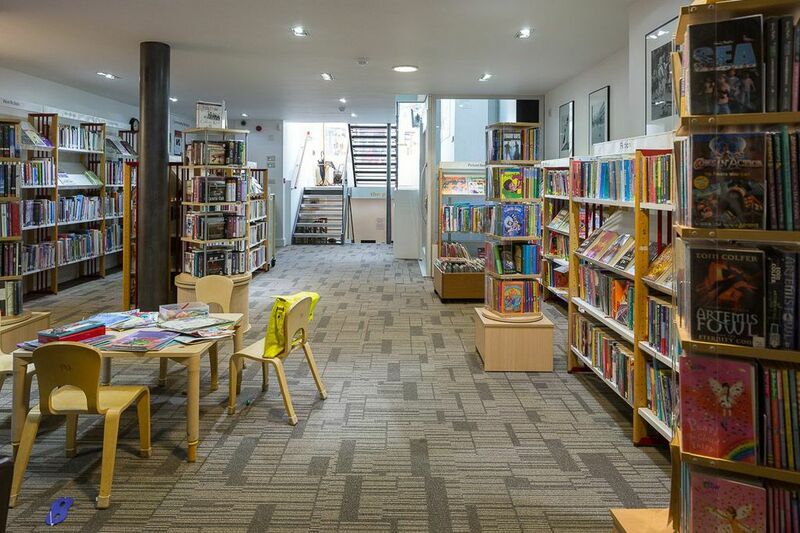 Blackheath Village Community Library is run by the charity, Age Exchange, from the premises of the charity’s community hub, The Exchange. It houses computers and runs IT courses. The Exchange is a ‘not for profit’ café in the heart of Blackheath Village, opposite Blackheath Train station. What I love about The Exchange is the fact that it is run by a charity doing great work towards reducing loneliness for people who suffer from dementia and their carers. It is mainly run by volunteers of all ages and a great space for community with weekly classes offering Belly Dancing, Tai Chi and Rhyme Time for kids. Volunteers and the staff all are very friendly. The café has a kids’ corner for reading and drawing and there is a lovely courtyard garden maintained by their 94 year old volunteer which is a quiet oasis. It is one of the few places in Blackheath where I feel happy to be sitting and enjoying my meal and a cuppa. The best thing about this café is the warm and friendly atmosphere where all the community can come together. I love the mix of a new and bright space with the older artefacts around the building. The volunteers who run the library and help in the café show just how a community can come together. The great thing is any money made in the café goes back into funding the library and groups to help people with dementia and their carers. Address: 11 Blackheath Village, SE3 9LA. Cafe: Yes, the menu is light – food is simple but wholesome, serving sandwiches, toasties, soups, jacket potatoes and selection of cakes. It even has a kids’ menu with smaller portions for little tummies. Low cost good value food and drink mean you can pop into this café as often as often as you want. A quick snack with the children and a coffee for myself is affordable, with lunch for under a fiver! Toilets: Downstairs, behind the library, there are two good-sized, clean and bright toilets, one of which has a baby changing facility. The toilets are easily accessible with a lift connecting all floors. Pram/wheelchair/mobility friendly: The building has two lifts (one at the front and one at the back) making it a pram and wheelchair accessible. The access to the garden is step-free. Parking: There is no free parking but there is a pay and display car park near the post office. Train: Blackheath Train station is just across the road (two minute walk from the Exchange). DLR: Lewisham and then a bus. Bus: 54, 89, 202 and 108 stop right outside. Phone: 020 8318 9105 for the café. The library is run by volunteers of all ages and aims to support active aging and reducing loneliness by bringing the community together. Services and activities run from Monday to Saturday. There are adult, teenage and children’s fiction, academia and textbooks. There are a few computers and computer classes run by the charity volunteers. The children’s section has a great range of books for all ages with plenty of space to sit down and read with your little ones. There is also a table and chairs for the little ones to do some creative colouring. Every second Saturday of the month there is a book shop run by the Friends of Age Exchange in aid of the charity, with stock constantly refreshed and excellent bargains.